I almost didn't post tonight. We just didn't do much of anything worth talking about. Every time I talk to Laurie, one of us always says "So what do you know?" and then we can usually rattle on for an hour and then there are days when the answer is "I don't know ONE thing" (and then we still can usually rattle on for an hour) but this is one of those days where I don't know ONE thing. 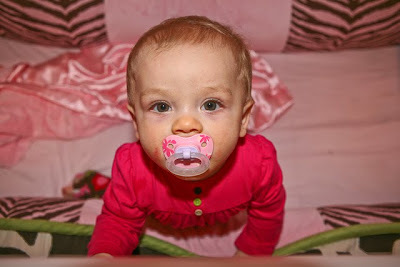 I took these pictures of Harper when she was "supposed" to be napping this afternoon. She pretty much sat in there and talked to herself for the longest time before I finally got her out and decided we need a trip to Tar-Jay! You may see that my bumpers are back. We took Harper's bed down as low as it could go and for now - I think we are safe to have the bumpers back. She's not trying to climb out and I don't think she could if she wanted to (YET). And she kept bumping her head so I was glad to put them back! The best news of the day is that for the first time in probably six months - I got caught up on laundry!!!! Of course I took this right before dinner and bath and bed time so the basket is back half full now. ha! But for one gleaming moment - it was empty and glorious! Do you ever have one of those nights where you try to cook something different and it turns out horrible? It doesn't happen often here but I tried something tonight and it was just YUCK! Scott (bless his heart) ate it but I just couldn't. Harper cracks us up because she is a good eater but there are certain things she just does not like. And before you can get the first spoonful to her mouth she is screaming and crying huge tears and turning red. I don't know how she knows. Like tonight I had out a jar of squash (which she HATES) and a jar of a fruit medly (which of course she loves). She usually will eat most vegetables but she can't stand squash. And this was even a brand I had never bought before so she doesn't recognize the jar but before I could get it to her mouth she was throwing a fit. So I gave her some fruit and she was happy as a clam. So every 4-5 bites I would slip in a bite of the squash and she would instantly scream and throw a fit. Oh my - we have a drama queen on our hands. Haha that's adorable! She really is the most precious little girl! Ah, an empty laundry basket! I think thats happened here once or twice in 10 years! :) Harper is as precious as ever. I'm with her on the squash though. Unless, its fried, of course! Kids amaze me, how can she knows that it was squash? My niece is 3 years old. I traveled to Paris for work and I sent her a gift. My sister explained to her that I have sent the gift from Paris. She asked what I was doing in Paris, since it is so far away. And then my question: how does she know Brazil is far away from France? Kids... they are God's blessings. Good for Harper. I scream every time Judy tries to get me to eat squash too. Just give her a little steak and she will be very happy. wohoo..I never am the first to leave a comment :) My sink (finally) looks like your clean laundry room, but alas, it won't last either!! i decided tonight that being grown up isnt all it's cracked up to be..cooking, grocery shopping, paying bills. boo. I'm with Harper on this one, I don't like squash either! Great news on the empty laundry basket! Mine seems to fill up as fast as I can empty it! Harper is just too precious! Oh and yes I have had one of those dinners where ya try something new and it is horrible! My poor hubby choked it down before but like you I couldn't stomach it! Hi Kelly! On a dinner note... I made your Chicken Breast Supreme tonight and it was a HUGE success! My husband just kept saying, 'Wow, this is awesome.' Thanks so much!! Your pictures of Harper just make me smile- she is such a cutie! I don't have much to say either today but I wanted to tell you I saw footed pj's at Sam's this past weekend all the way up to like 4T. Stock up!! I really liked this post and it makes me realize how much it makes ne feel better to know the true stories of other mommies because we try hard, but it is never perfect. What a relief to have all the laundy done?! Man...can you come do my laundry??!! 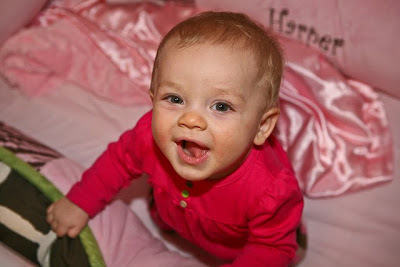 It is neverending:) Miss Harper is a cutie-patootie in those pictures...as always!! With nine people in our happy home, we NEVER are completely caught up on laundry! You've made us all curious (I can't be the only one, can I?!) What was the meal that was a complete failure? Someday Harper will love squash, I'm sure. I wonder if she'd eat pureed pumpkin! I make dinner disasters quite often! Tonight I tried to make chili with beans in a separate pot (I don't like beans), and I burned them. Hubs won't be happy when he gets home...the beans are his fave. Dinner disasters are what take out is made for!!! I get the laundry completely down once every three or four months. I thought I was the only one! HAHA! I tried to make a special carmelized chicken dinner when I was pregnant once. I set the glass dish on the hot burner and it exploded everywhere. I was an emotional, hormonal mess in tears. Nothing was saveable... we had take out! Just tonight I messed up dinner. I used the wrong meat (thin brisket, instead of chuck round/rump round) for a long day of crock pot cooking. It smelled so good, but the meat was really hard and we could barely cut it. It turned out to be a sandwich night. drama queen is right! that is hilarious that she knows before you even get it to her mouth. She must have a really good sense of smell!! My daughter just said, why does that baby have my nuky!!! HA HA HA!!! Way to go on the laundry, sister!! :) That's always such a great feeling. Enjoy your night. Hopefully Harper will sleep for you tonight. I love a girl who knows what she likes!!! And the conversations that come from not knowing ONE thing are usually the best!!! That's a hoot about Harper's food preferences. Sometimes I feel like pitching a fit when I want something to eat that we don't have in the house! haha! 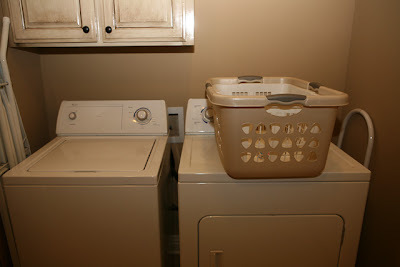 LOVE getting caught up on laundry...but it's like the dishes; a never-ending job! I just don't enjoy those jobs very much since you are NEVER done with them! Have you tried giving Harper pumpkin yet? Get a sugar pumpkin (aka pie pumpkin...one of the those smaller, round pumpkins) and go to http://www.wholesomebabyfood.com/pumpkin-babyfood-recipes.htm for directions on how to prepare it. Colten LOVES pumpkin puree with applesauce. LOVE it! I added a bit of cinammon in the pumpkin for a little introduction to spices as well. Smells so good! Girl, I never seem to get caught up on the laundry - even for a moment. Good for you. And I know all about the drama queens. I have one. She can turn the waterworks on and off at the drop of a hat. But she keeps life interesting. Have you tried (sneaking) part spoonful of squash and part fruit, of course the fruit on the end! It has had some success!!! Hey Kelly! I am sure you get these all the time but we are supposed to say who we give this to but I gave you an award on my blog! your blog has been inspiring me for a year and continues to so of course you came to mind when I was doing this! Thanks again for being such an inspiration! I have NEVER been caught up on laundry. Well, an exception, when my mother has been here and done it for me. Funny about the squash. My little girl is the same as Harper with things she doesn't like. At her 9 month well visit were told to start giving her iron supplements as she is a little anemic. Well, I finally gave it to her in her cereal tonight. You would have thought I gave the girl poison (I have to say I wouldn't eat that stuff). It actually ruined the rest of her dinner. The baskets around here don't stay empty for long either. I normally do at least 2 loads a day. Harper is as cute as a bug. oh I need to catch up on laundry! I lvoe the feeling! When husband asks where something is and I can say "every piece of your clothing is clean" I have been sneaking food in too with my Helen (7m). I go as far as to get a spoon of veggies (she does not like greens) from the jar that I am hiding, and then let her see me dip the spoon into the jar she likesa (peaches, apples, etc) it works 50% of the time! Too funny...smart girls they are! Cute pictures! I was also concerned with the the bumpers my girls' cribs. I was told that they are a choking hazard and suffocation hazard and shouldn't be in the crib, along with blankets and pillows? Not sure when they are safe, but just thought it might be something to look into----she is just too precious, I thought I should say something! LOVE your blog!!! Devin was that way with peas! What I read, that sort of actually worked, was to mix a little of something she likes (fruit medley) in with it and she might actually eat it. Don't get me wrong, I never bought the puree again and she won't even eat whem whole (hubby hates peas too), but she did tolerate a few more bites than expected when I mixed some of her fruit in with them! Oh, and we never fed out of the jar, but from a sectioned bowl. That helps them to not know what is coming! I love reading about Harper each day! Have you tried mixing the squash and fruit? Fist add squash and next add the fruit, so the fruit touches her tongue first. Think of it like apples baked in an acorn squash. I don't blame her, I'd scream too if someone tried to feed me squash, hee-hee! Congrats on getting caught up on laundry. That will never happen in my house. My hubs eats the crummy food I make. Good men we have. Have a good week. I hate trying new recipes and them not turning out! I had a similar experience last week. It was so yucky, and I cooked extra that ended up in the trash. My grandmother and I guess her dad started a thing in our family were we would ask if they know any gossip! I thought you'd find that funny, seeing as you're a southern gal! And kids are just so keen on everything! That is too funny!! I baby-sat today and she's almost 10 months, and I was feeding her "pear/squash" so maybe try mixing the squash w/ a fruit if you have any left! Dinner is always a battle of wits at our house! When my daughter isn't looking, I sneak veggies in to her food and when I'm not looking, she sneaks them to the dog! Ha! Our laundry pile is never ending - I look it as job security though. I'm sure somebody here already suggested this, but try putting half a spoonful of squash on the spoon and masking it with a little fruit on top. She will probably see through the deception but it's worth a shot! Some may consider me a horrible mother for doing this, but my child's bumpers are still in her bed and she just turned one! She has NEVER tried to climb on anything and it just hasn't been a concern for me. i have been w/o a computer for about 2 months now and i have missed rdg about you and your precious family!! harper is a doll baby!! my boys did the same thing w/food they knew they didn't like!! ha!! it's amazing to me how they just 'know'!! I am with you on trying new recipes that don't work...my husband is the same way - he will eat every bite (of course telling me days later that it wasn't that great) but I will always say, "I can't eat this...." and fix something else while begging him to do the same - ha! 2) It is possible to get caught up on laundry (YAY for you, btw!!) --even with a mobile baby girl. 4) Sometimes new things don't work out (i.e., your dinner), but your husband is a trooper and the important thing is that you keep trying (which I'm sure you will)! I look forward every morning to seeing your blog...so even when you think you have "nothing" to say, it still blesses me! :) Have a great day!!! She is such a cutie!! Try hiding the squash behind the fruit on the same spoonful. I could trick my kids most times like that. My husband says, if it tastes good, that's all that matters (doesn't matter what it looks like). I love having all my laundry done too! Way to go! Ethan didn't like quite a few veggies, especially green beans, he hated those! So my dad taught me a trick that he used on us girls. Half veggie and half fruit on the spoon! Ethan ate everything after that! I kind of enjoy the posts about nothing. It really brings home the fact that you are a tired, momma working hard at home. LOL! Speaking of tired, lil Harper's eyes look tired in that first picture. It was sad. :( She is too busy being social with her animals and stuff to nap huh? HA! That is funny that Harper throws a fit about certain food. Both my girls are turning into picky eaters. Kennedy is picky and won't eat much, Marlie will eat a TON if it's something she likes or wants. But if she isn't interested, she shakes her head NO and gives you the sassy look. She is only 15 months old! Lord, please help me. HA! Have a great day! The story about dinner totally reminds me of my husband and I. He can usually eat something new I do not like, but I can NOT eat it!! I guess our husbands are just good sports!! HA! That sounds like our day yesterday too hence my excuse for not blogging last night! lol Harper might have a good sense of smell & know the squash scent when you open the jar? She's a smart girl! I'm so jealous of your empty laundry baskets. That happens occasionally around here & I make my husband take me to dinner when it does, because it's such a huge feat! Having 2 boys ages 15 & 10, a 15 month old baby girl, & a husband too makes laundry a never ending cyle at my house. About the dinner- I'm a self proclaimed terrible cook. I can seriously mess up anything. I have a handful of recipes that everyone in our family likes and always turn out. I'm on a kick right now of trying new dishes and it is really frustrating to put all the time and effort into a dish that no one likes! ut we have found a few new good ones. I love reading your blog. Harper is SO cute! !